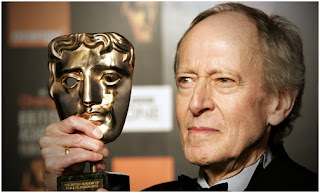 Ricorda Garland: "My eclectic WNYC-FM radio show Spinning On Air has been on the air since 1987, and sometime back in 1992 I broadcast some of the wonderful film music of John Barry. To my surprise I received a letter (back in those pre-email days) from John Barry's wife. It turned out that the Barrys were living on Long Island and had listened to the program. I was thrilled to invite John Barry onto Spinning On Air so we could listen to a lot of his music and talk about it in depth. The result was two hour-long shows which aired in December of 1992 and January of 1993. We cover his early fascination with film, his love for creating dramatic music, his pop group The John Barry Seven, his innovative use of orchestration and the recording process, and much more - including his story about who really composed the famous James Bond theme. John Barry was a wonderful, generous guest who had insightful, entertaining things to say about his creative work. In the world of film scoring, his music was unique and innovative, and helped shape the movie-going experiences of generations."